This post is sponsored by the Canned Food Alliance. Vegetarian Spaghetti Squash Boats are the ultimate healthy comfort food made whole simple ingredients just right for a weeknight. Who’s set New Year’s resolutions already? I can tell you this much, it’s on my to-do list. My goal is to sit down long enough to evaluate last year and put together a list of goals for 2015. Maybe I will need to resolve to clear my schedule and prioritize my goals before I can set new goals. Any who, I’m a list maker and thrive when I have a schedule with things to cross off. Even simple stuff like “give Pearl a bath” or “send so and so an email”. Maybe this is extreme, but I can easily forget things if I don’t write it down. I love how the New Year gives a fresh perspective and a time to look back at how things are going so that we can move forward and grow. Many people have goals of nourishing their body with healthy foods and increasing their intake of fruits, vegetables and fiber rich beans. Nourishing my body with healthy foods and exercising more is a continual goal for me. Specifically this year, I want to make our food budget more of a priority. After a long day of work and evening CrossFit workout, it’s easy for us to resort to eating out for convenience. Yep, there goes the food budget. So this year I’m going to take it a week at a time and work really hard at cooking more. I love using healthy convenience foods like canned beans in recipes, because they are a great fiber source, economical, and so versatile. 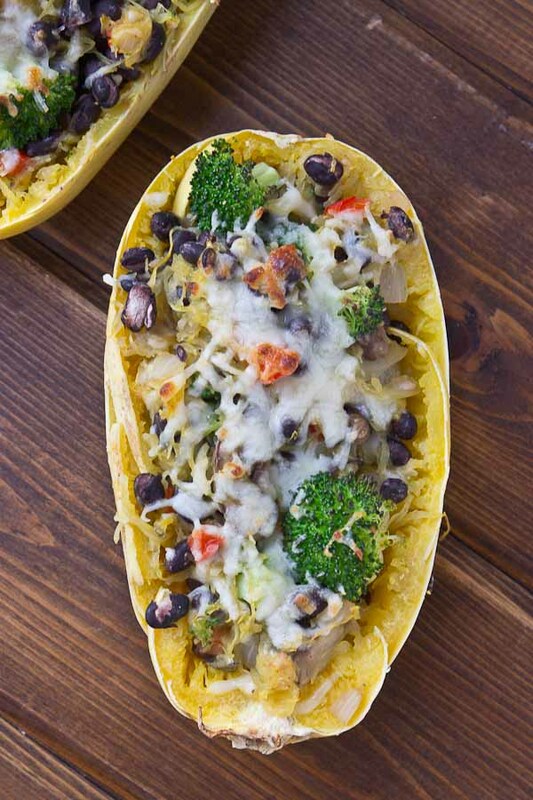 These Vegetarian Spaghetti Squash boats are made with canned black beans, lots of veggies especially mushrooms because they’re my fav and topped with yummy sharp cheddar. 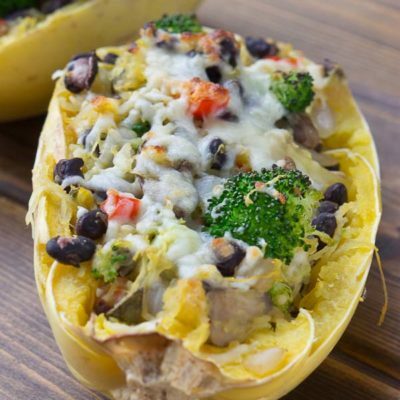 I love how versatile spaghetti squash boats are too– you can simply mix in whatever ingredients and beans you have in the pantry and it tastes like you’ve spent hours in the kitchen!! My kind of meal, peeps. If you’re worried about sodium in canned beans, look for low sodium or no salt added versions, or do like I do and rinse and drain the beans. In fact, research shows rinsing and draining reduces 41% of the sodium content. 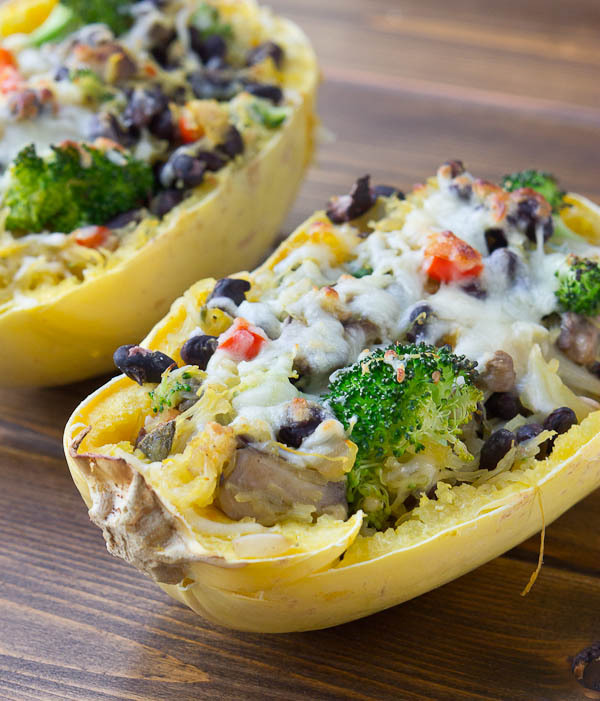 Don’t wait to try as long as I did to try these Vegetarian Spaghetti Squash Boats. I promise they are incredibly simple to prepare on a weeknight… you’ll be amazed. They are meat and potatoes lovin’ husband approved too, and that’s sayin’ somethin’. What goals have you set for this year? 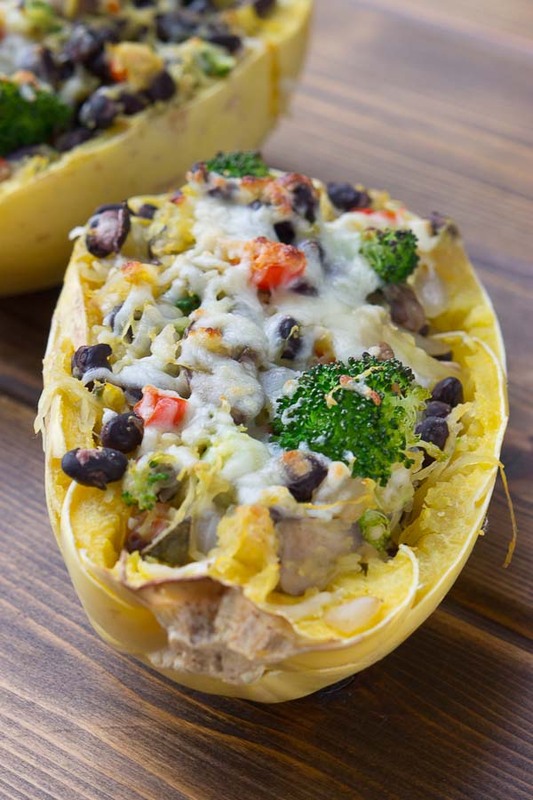 Have you tried spaghetti squash boats? Cut spaghetti squash in half from top to bottom. Scoop out seeds and place flesh side down in large microwave safe bowl. Microwave for 7-8 minutes; allow to cool. Meanwhile, heat olive oil in cast iron skillet and sauté onions, peppers, garlic, and mushrooms together until softened. Season with salt, pepper, and Italian seasonings. Bake in oven for 8-10 minutes until cheese melts. Making this over the weekend, looks delish!! YES!!! So good! I want some too. YUM! This looks so delicious. We love spaghetti squash, and I look forward to trying out this recipe. Our go to is spaghetti squash with roasted chicken, EVOO, fresh cracked pepper, sea salt, and pine nuts – plus pecorino romano cheese for my hubby. But the same old thing gets old..
We do not do resolutions, but each year my husband and I pray for the Lord to place a word for the year on our hearts. This sets a tone for the year or a lens from which to view the year and grow. This year my word is reverence. From my faith to taking care of the body God has blessed me with, I will approach each day in reverence, (or at least try to). I find when I align my sights on God, all other things fall into place, from self-care and deep soul peace to schedules and priorities. I am by no means perfect, and fall short daily, but am thankful for grace and new beginnings. 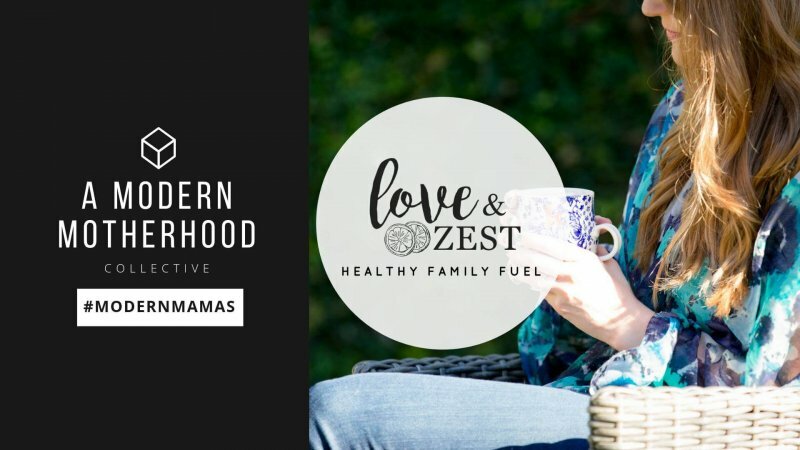 I love your heart in this post! What a great way to set the tone for the year. Love that you and your hubs are in it together. So beautiful!! YES!! My kind of girl. Love nutritious and easy recipes, like this one!! I use canned beans all the time. The good ol’ rinse and drain is perfectly fine with me 🙂 Now I’m craving spaghetti squash – yum! I’m going veggie crazy lately. Look at all those great vegetables tucked in here! I LOVE baking spaghetti squash! I’m so new to baking spaghetti squash because it seemed so complicated. BUT OMG– had some for lunch today. This looks great! Spaghetti squash is one of my favorite vegetables! It makes a yummy veggie packed meal too! 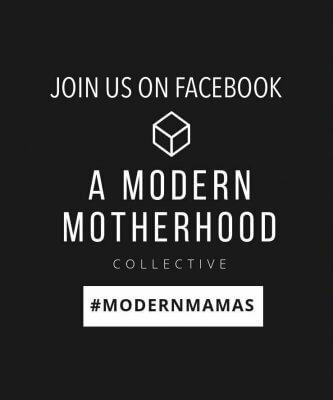 We ate out way too much over the holidays (Tim didn’t complain) but it’s time for us to get back to our normal schedule. We or I make it a priority for us to eat out at max 2 times a week so I could spend that extra money at the groceries. I def like to stock up on canned goods ;). 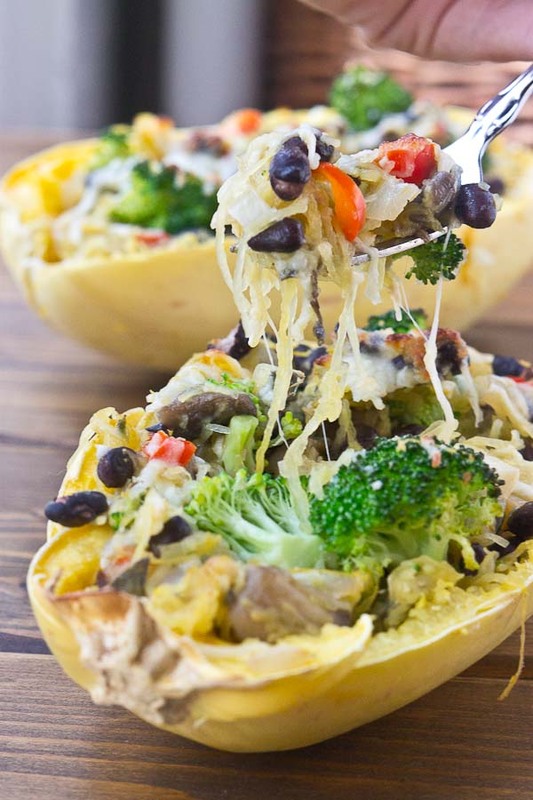 I shall def be making this spaghetti squash boat soon! Oh Min, you crack me up. 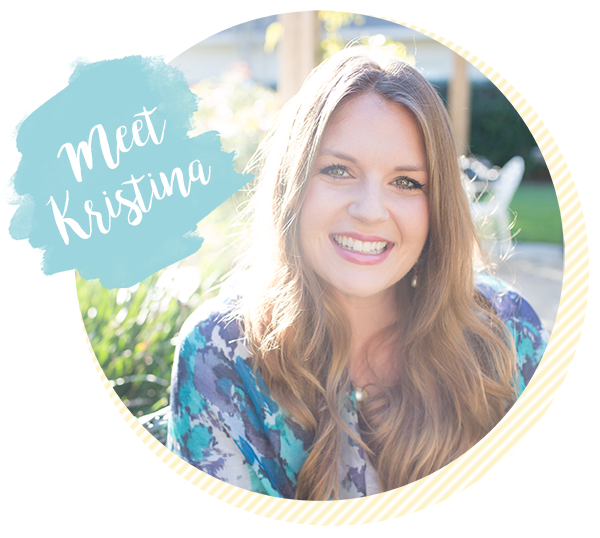 I love pushing that soft reset button after the holidays/or traveling for that matter. It feels so good to be back in the kitchen again. I totally have to write EVERYTHING down to remember. It’s awful. Love that I can have a whole half a squash and not even feel guilty about it. Looks so healthy & delicious! It’s a nice size serving but you can also get the baby spaghetti squash (I can’t always find them) and it would make a great side, or a light meal. I made spaghetti squash last night, you’re totally right about how versatile they are- threw in veggies, goat cheese, and voila! Bonus if you can get your husband to cut and roast the squash since thats the hardest part for me! OMG goat cheese… I’ve gotta try that next time. Agree they are darn hard to slice– but I don’t roast I just microwave, so much faster!